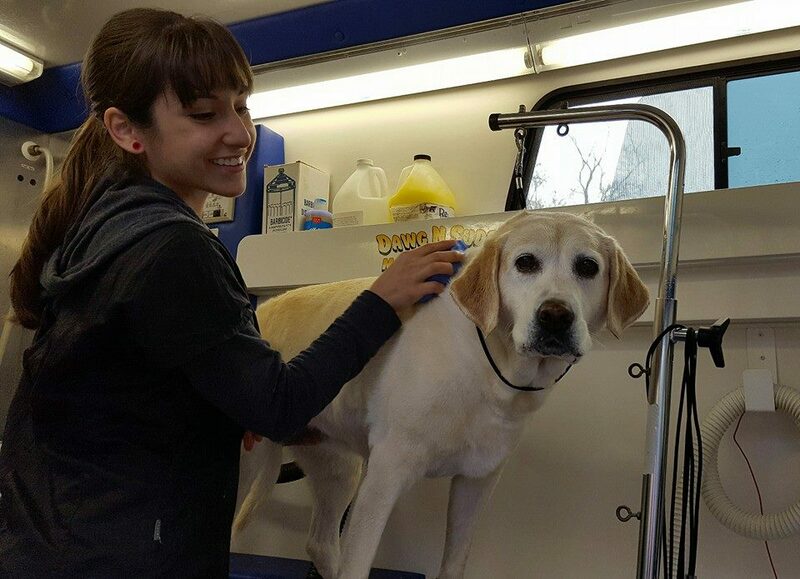 We are a full service dog grooming salon on wheels. We take your dog from scruffy to FLUFFY right outside your front door...and in just a fraction of the time of a normal trip to the groomer. That's right, no more time consuming trips across town to get your 4 legged family member groomed. With our all inclusive mobile grooming service we offer curbside grooming at your convenience. We are a completely self-contained mobile grooming unit with an onboard generator and hot water tank so no hook ups are required. You can have the assurance of knowing that your pet is getting one on one attention with no distractions from other dogs or clients. Your dog will receive a personalized pampering and grooming session in a quiet and comfortable stress-free setting . We use state of the art hand blow dryers so your dog is never cage dried and will be under the constant supervision of the groomer at all times. When finished, your baby will be hand delivered right back to your front door. We are based in Northwest Indiana and currently offer services in LaPorte and Porter Counties as well as Grand Beach and New Buffalo, MI. Average grooming times range between 1 - 2 hrs depending on the type of breed, coat condition, and service desired. Please fill out our form below and we will contact you to provide you with a customized price quote and to schedule an appointment. Our base price for a standard grooming starts at $70.00 and goes up from there based on breed of dog, coat condition, and type of service desired. Please contact us by email at info@dawgnsuds.com or by phone at 219.871.9807 for a customized price quote and to schedule an appointment. If sending an email please provide your name, address, and a phone number where you can be reached. *Prices quoted over the phone are only estimates and subject to change upon examination of the dog. *There will be an extra charge for excessively matted coats and for pets who have not been groomed regularly. The additional charge will be determined on an individual basis and will be agreed upon prior to service. Top 10 Reasons Why It Costs More To Get Your Pet Groomed Than Your Own Haircut! You don't go eight weeks without washing or brushing your hair. Your hairdresser doesn't remove the boogies from your eyes. Your haircut doesn't include a manicure or pedicure. Your hairdresser only washes and cuts the hair on your head. The likelihood of you pooping on the hairdresser is pretty slim.